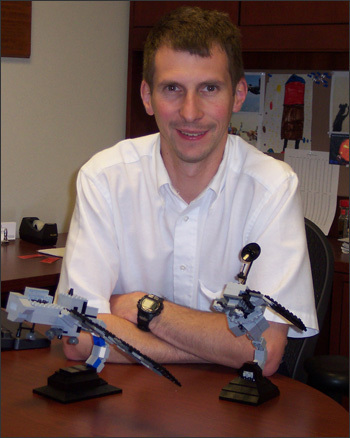 Creator Tom Hill with his Landsat 7 (left) and Landsat 5 (right) LEGO models. Did you know LEGO sells model kits that enable you to build replicas of the Landsat 5 and Landsat 7 satellites? Well, thanks to Tom Hill of the Landsat project, they do. Serendipitously, after taking a position in Landsat flight operations last fall, Tom spent an evening playing LEGO with his son and looking at pictures of the two orbiting Landsat satellites. During playtime over the next few evenings he created the prototype for the LEGO model kits. “Using pictures of Landsat 5 and 7 and the LEGO we have at our house, I built versions of the models quite similar to the final versions now available through the website,” Hill explains. Once he was satisfied with his model, he used LEGO’s digital designer software to build a virtual model online. He submitted this virtual model for review by LEGO. The model was approved and LEGO Factory started selling the Landsat kits in March 2007. The Landsat 7 satellite is currently selling for just over $30 and Landsat 5 is about $20. The price is determined by the number of LEGO bricks used. Hill doesn’t know how many Landsat model kits have been sold by LEGO; he has no financial tie to the company. In effect, his technical designs and creative time were donations. Landsat 7 (left) and Landsat 5 (right) as LEGO design drawings.